The soft glow of this painterly nightlight illuminates a sweet scene of a baby elephant tagging along with its parent for protection against the backdrop of night. When aglow, the luminescent glass mosaic fills a room with ambient colored light that is bright enough to illuminate obstacles, but soft enough to sleep through. The colorful, textured glass is made from 100% post-consumer bottle glass, kiln formed by artisans Vawn and Mike Gray. Handmade in Cape Coral, Florida. The only nightlight for my grandson! 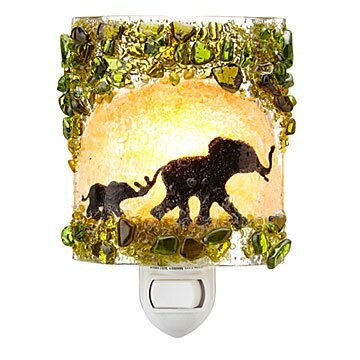 We love this night light. We use it every where we go and if we fly for a trip it has to go with us. I've bought another one to stay at the grandparents house too! I bought this for my niece for her first birthday. She loves it! Mom and Dad have reported to me that she sits up in her crib and just stares at it. It's a beautiful, unique design that gives the room a soft, comforting glow. I use it in the bathroom that is in our upstairs hallway so the three bedrooms get a very light amber glow from the bathroom. This is excellent so that nobody has to walk in the dark during the night. The colors on the nightlight were bright and beautiful. The quality is amazing and the nightlight is just as it shows online. I would order from this company again. This nightlight is super cute and puts off nice light. I would buy another one if I had a need for it. I collect elephant figurines and the colors are perfect in my kitchen! I would buy this again! It's the cutest. I was looking for the perfect gift for my Dad who says he has everything. This light was perfect. I found it browsing your website. So many great ideas at Uncommon Goods! Thank you.